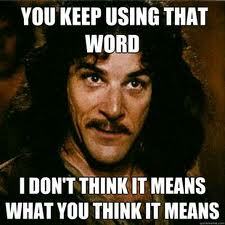 Inigo Montoya famously said, “You keep using that word. I do not think it means what you think it means.” Journalists seem especially prone to the Inigo Montoya problem, especially when it comes to basic ideas in international relations. David Sanger had an article in yesterday’s Sunday NYT op-ed section titled “Deterrence Revisited“. In it he argues (borrowing from a White House official) that President Obama is trying to find “a middle ground between the isolation strain that has emerged and the overextension of the past decade”. This has become a common, well-worn trope: present two “extreme” points of view (“isolationism” poorly-defined on the one hand and whatever it was that George W. did on the other) and then present something vaguely in the middle as the “reasonable” center. Nixon’s aphorism that we’re all Keynesians may or may not be true, but we sure are all Hegelians. Deterrence, of course, is all about the perception of power. It hinges on convincing adversaries that, with force, guile or economic isolation, you can make them think twice about acting against American interests. The problem with applying the concept of deterrence to any behavior that “acts against American interests” – that is, anything that US policymakers don’t like – is that it stretches the idea well past the point of usefulness. Deterrence, in the way it was developed during the Cold War, applied to a much narrower problem: how do I keep an enemy from attacking me? In a bipolar conflict with both sides having allies, this eventually spawned extended deterrence: how do I keep my enemy from attacking my allies? Even this was a bit problematic, as theorists argued back and forth whether the US would “trade Chicago for Paris”. But the root problem was simple: preventing a war and insuring basic security. In Sanger’s formulation, however, deterrence is the all-purpose tool for every foreign policy problem. Russia acting up? Muscle up to deter them from behaving badly. China being aggressive about some bit of water off of Vietnam? Try deterrence! I imagine you could put together a great infomercial on this theme. Sanger is right about one thing: deterrence is about perceived power. But his desire to use that power to prevent anybody anywhere from doing anything we don’t like is a recipe for disaster. As simplistic as it is, he should go back and read Walt’s 5-minute lesson, especially the section about Balance of Power. The US is not omnipotent. Even at the height of the “unipolar moment” in the early 1990s, there was much that American power (or fear of it) could not accomplish. It did not stop Slobodan Milosevic from rampaging across southeastern Europe, it did not prevent Hutus from slaughtering Tutsis in Rwanda, and it did not stop a ragtag band of thugs in Somalia from embarrassing the US armed forces in the streets of Mogadishu. Sanger pines for the US to do something about “the civil war in Syria, … the stateless power vacuum in Libya or … President Vladimir V. Putin’s power plays in Ukraine”. But he doesn’t say what, exactly, other than to suggest vaguely that President Obama has been too “weak” and needs to adopt a more muscular approach to foreign affairs. This is the sort of macho fantasy that plays well in certain political circles, but which does not produce results, only disasters. Muscle blows stuff up; it doesn’t fix broken countries. And it is extremely unlikely to prevent Russia from doing what it wants in its own front yard. Let’s hope that cooler heads prevail in Washington. Deterrence is a tool built for one primary purpose: preventing attacks by our enemies (and not all enemies can be deterred). Waving it as a magic wand to cure all ills is foolish at best, and disastrous at worst. Perhaps the problem is not the tools we are using in foreign policy, but our unrealistic expectations of what they can accomplish.